If a washing machine measurement states that it is 60cm depth, does this mean that all the piping and electrical wiring at the back will fit under a worktop of 60cm depth, or that it needs just that little bit extra space as well as the 60cm in order to fit? You can never be totally sure the measurements quoted in the specs would include the space that the hoses take up. If it’s mission critical you should always try to physically inspect and measure at a showroom or at least get confirmation from a sales person. 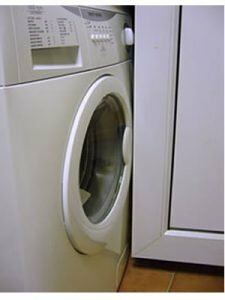 Normally the measurements of a washing machine’s depth should include the whole area the washing machine will take up including the lid (which may or may not overhang at the back). If the lid overhangs at the back (see photos) then the fill and drain hoses may well fit underneath the lid and not take up much if any extra space. If the lid doesn’t overhang the back of the casing then the hoses are likely to take up extra space and not be included in the quoted measurements. Also don’t forget that the space taken up by a wall socket or the waste water stand pipe if fitted may also stop a washing machine pushing all the way underneath a worktop unless it has a big overhanging lid at the rear. For most people the depth is the least critical measurement because not having enough depth usually only results in the washing machine jutting out more than ideally required, it rarely stops one actually fitting in place like not having enough height or width will. One thing to bear in mind though regarding a washing machine not fitting all the way back under a worktop is if there is a kitchen drawer or cupboard, or even a door that opens across the washing machine (or tumble dryer) it could catch on the washing machine if space is tight and the washer has bulbous parts at the front. Many washing machines these days have bulky front designs where the front casing bows outwards. Often the door and sometimes control panel, knobs or buttons can also jut out a fair bit. This can cause problems if a door or drawer opens out across the path of the washing machine. These protuberances are not usually accounted for in the depth specifications so again, if mission critical you will need to take your own measurements trying to measure from the bit that sticks out most at the front to the bit that sticks out most at the back. However, that was fine when all washing machines had normal size drums. The emergence of larger capacity drums in washing machines (some as large as 11Kg) has meant many modern washing machines are now much deeper than they used to be. Much of the extra space required for a larger capacity drum comes from making the drum deeper, which is why so many are now 60cm taking up the entire space for a washing machine in many fitted kitchens. If short on depth space it may be possible that some the smaller the drum capacity the less deep the appliance will be although it’s also possible that they may all use the same basic cabinet to save on production costs. Generally these days many washing machines do have an overhanging lid at the back. The lid may be 60 cmm (600mm) deep but the back casing is often less deep meaning hoses have some room to sit between the back of the casing without extending beyond the space the lid takes up but ultimately if things are that tight you will need to measure it yourself. These photos show a Miele washing machine and a John Lewis washer dryer, both with overhanging lids that extend further back than the actual casing allowing some room for the hoses to fit within the space taken up by the lid. We will be having a problem in the near future regarding our washing machine. When we had the kitchen stripped out in 2008 and replaced with integrated appliances. The kitchen company offered, as an option, all white Whirlpool appliances, each of which were to be integrated. That was fine by us and we were pleased with the Whirlpool products. 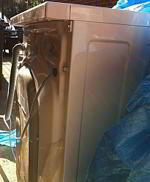 However, time passes on, and we are considering in the near future to renew the Whirlpool Washer Machine/Dryer. To my horror I find that Whirlpool no longer do a Model that has the same depth dimensions of our current Model. All their Models are at least 550mm depth whereas our current Whirlpool W/M is 525mm. Bang goes the ‘integration’ theme for ensuring a clean line in the kitchen! What bright spark in the Whirlpool manufacturing world thought that one up? If anyone knows of a W/M that has a depth dim of 525mm or less I would be pleased to hear about it. Hello David. Did they build the kitchen units exactly around the appliances? That would be pretty silly. 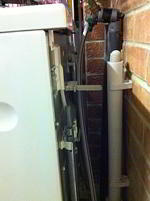 Are you sure your current washing machine takes up all of the depth space? An appliance slot for any white goods appliance should always be 600mm wide and 600mm deep. When done like that, all built in appliances will fit. Many may be less deep and just not fit all the way back. We have just bought a Samsung washing machine advertised at 600mm deep however on trying to install have found it to be over 680mm!! Unfortunately the space it was to fit in is 690mm deep and therefore it is not possible to install it and close the doors in front of it. Surely samsung can’t be out by 15% on the dimensions… will this be an issue with other manufacturers also? This is what my article says Ed, you just can’t trust the measurements. You should be able to send it back. A standard cabinet is 570mm deep and the distance from floor to the underside of the worktop is 870. A cab is 720 high with and additional 150mm allowed for the plinth. This is the playing field you have to work around. Most Dishwashers are 596mm ish to fit within a 600mm cavity and they are about 820mm high. The depth is crucial. Watch out for your power socket. if it mounted too high, it interferes with the back of the unit – you have to use a fused outlet. To re-enforce teh core message of the article – check your measurements against standard cab sizez and make sure it fits – watch out for power, water and waste conections – they all take up room. 1) Ensure you have the standard ‘space’ in the kitchen (600W x 850H x 600D) or at least within a few mm of those dimensions. MOST but not all machines will fit. Some of the larger load washing machines can be problematic. I am having problems buying a washing machine for my property I have looked everywhere for a machine with these dimensions (H) 89cm (W) 58.5cm (D) 62cm the depth and height are fine but most washing machines are 59.5-60cm will they still fit or not.